I call this last set of pics my "Endless Summer" series. 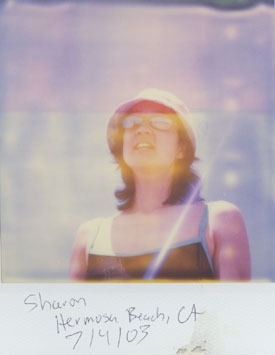 When they first came out of the SX-70, I thought the film was really jacked up - the colors were all splotchy and there's no clarity in the picture itself. I'm assuming the film I'm using is too old to be reliable yet these shots all turned out to be great summer photos b/c the colors that do bleed through - yellows, oranges, reds - all seem apt for the season. They just look like they were taken at the beach (which they were). Unlike most of my other scanned in pictures, I didn't Photoshop adjust the colors on this - I wanted that washed out look that the original shots came out in.